Triumph street triple rx 2015 engine rs cover guard kit covers. Triumph street triple rx motor housing protection kit 2015> 2017 the kit includes two components: the protections on the right and on the left these engine cover protections, developed on the track by the British specialist r & g, are projected in polypropylene 4 mm thick , strong, durable and beautiful to see. The protections are simply screwed over the original covers, without the need to drain before oil or other liquids and do not involve to glue or other modifications of any kind. They are projected to maintain the maximum ground clearance, very light, with a matte finish and to protect the more exposed parts of the engine. These protections save expensive engine damage in the event of a fall. 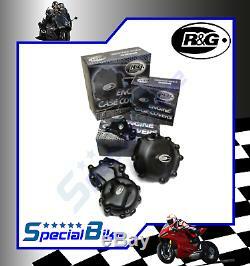 The r & g sump guard is approved by leading international motorcycle organizations. The regulation of the fim provides that: - all side covers of the crankcase containing oil, which in the event of a fall may come into contact with the asphalt, must be protected with an additional cover of the composite material. All guards must be projected to resist shock and abrasion and must be attached to the motor primarily with screws. Bonding with silicone can not replace screwing. The kit includes all the specific hardware in addition to the appropriate assembly instructions. The item may not be available in the store. In this case, the shipment will be made, depending on the availability of the producer, in 10/15 working days. The photos do not relate specifically to the proceeds of the sale. The product is invoiced and guaranteed by the producer. Any shipment outside the European Union may be subject to a procedure of opening and inspection by the customs authorities. Please note that when you are in command, you are considered as the official importer and must respect all the laws and regulations of the country where you will receive the goods. Deadline: the shipping is carried out by the carriers ups, dhl or sda with delivery and calculated on the basis of the weight and the dimensions of the parcel, under 3/4 working days. In case of multiple purchases, it is imperative to group your items before any validations of payment. Delivery times are well indicated. We invite the buyer to notify in case he wants a faster delivery than indicated. Our product offers are valid while stocks last, the purchased object is not necessarily available. In this case we will inform you of the delivery time. The purchaser has a period of withdrawal and refund of the amount. The delivery delay usually varies within 3 to 10 business days. In this context, all costs incurred for the return of the order will be entirely the responsibility of the buyer. In case of return: all costs are the responsibility of the buyer and will they be deducted from a possible refund. The products offered for sale are described and presented by the photos provided by the producer or the supplier of the object, with the greatest possible accuracy. However, if errors or omissions may have occurred in this presentation, the responsibility of specialbike could not be engaged. We cordially invite buyers to control the data on the producers' sites. All photographs or images reproduced in this site, even if for information purposes, may not refer to the exact object for the different applications. The purchaser is kindly requested to pay the payment of the object within 4 days of purchase. Otherwise, the object will be put back for sale and the seller may report a dispute for unpaid item. The feedback is left after the buyer. Before leaving us any evaluation neutral or negative, we ask you to kindly contact us, we will do everything possible to help you as soon as possible. Please do not leave rating below 3 stars which are negative for the seller. Or contact us by phone. A unique number is at your disposal to serve you better. The item "triumph street triple rx 2015 engine protection kit r & g covers" is on sale since Monday 9 October 2017. It belongs to the category "auto, motorcycle parts, accessories \ motorcycle \ spare parts \ engines, engine parts \ oil sump ".Alfio" and is located in torre del greco. This item can be delivered anywhere in the world.